Stengel was playing for the Pittsburgh Pirates, and returned to face his old team, the Brooklyn Dodgers. Fans were not happy to see him again, and taunted him every chance they got. 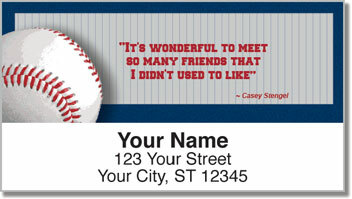 But Casey won them over with his charm. Somehow, he captured a sparrow and hid it in his cap. While walking up to the plate he lifted his hat to the the crowd and the bird flew out. The jeers quickly turned to cheers. 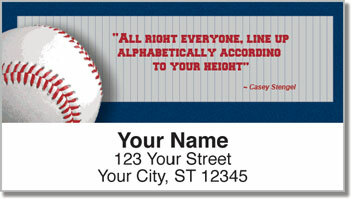 These unique address labels feature funny quotations from one of baseball's most colorful characters. They are printed on a self-adhesive backing to make the task of preparing outgoing mail extra easy. Order your own Casey Stengel Address Labels today! Get them with matching checks and free shipping.